Functional medicine sees health on a continuum - using unique testing that can help clinicians find out where you are exactly on that continuum and offer some predictive advice as to where you might be 1, 5, or 10+ years from now BEFORE problems develop. 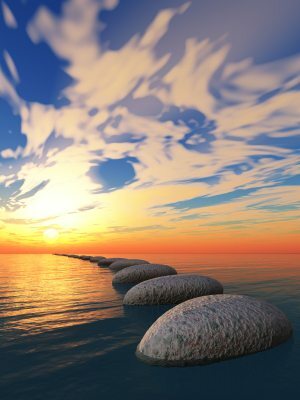 Functional medicine is a bridge between alternative and conventional medicine. It can be applied both acute and chronic conditions. It is NOT focused on a diagnosis. Once you see how different systems are functioning on a continuum of health, you can then work with your healthcare provider on unique food, supplement, and lifestyle strategies to help you function better. Drugs and surgery are still turned to when necessary. I have put together a collection of articles and links that I think will help you get a firm grip on what functional medicine is and how it is used. It may take you some time to go through the post, bookmark and revisit it as you need. I: What is Functional Medicine? III: Overcome the Tyranny of the Diagnosis"
A great place to start is a 20 minute introductory TED-talk from Dr. Mark Hyman, MD, an international spokesman for functional medicine. According to the Institute for Functional Medicine, Functional Medicine is based on 6 Key Principles. I have included some links below to help you understand these complex concepts. The concept of biochemical individuality was originally developed in 1956 by Roger J. Williams, PhD . It is probably the most important of all of the principles as it is about matching care specific to your physiology at any given moment. Also, check out his book detailing the same concepts The Paleo Cure and Unconventional Medicine. What’s New on the Food as Medicine Frontier? Much of the frustration with healthcare comes from the doctor-patient experience. Many doctors still only spend a few minutes with their patients and spend most of the time talking instead of listening. Can We Save Patient-Centered Care? Our healthcare system is really set up as a disease care system. Health is much more than just relief from symptoms and includes all aspects of life experience. Health is something that is promoted and maintained whereas a “disease” requires a diagnosis, treatment or cure. Functional medicine emphasizes those activities that promote health in the first place instead of waiting to “name, blame, and tame” an existing disease. Organ reserve is your body’s ability to support whole body health and bounce back from injury or toxic insult. If you have chronic stress, inflammation, infection or more, you can put a lot of wear and tear on your body’s ability to fight against future insults. Any time you hear about the promotion of“healthy aging”, you are hearing about the concept of organ reserve. Small stresses over time can and will lead to disease. For instance, Alzheimer’s disease may manifest in old age, but the process begins in your 20’s and 30’s. Functional medicine systematically identifies the underlying risk factors and addresses them before problems develop. If you think about it, “disease” is really an illusion. Just as darkness is the absence of light, disease is simply the absence of "ease" or health. It is just a name we give to core dysfunctions happening in the body. It still tells us little about how and why the disease or dysfunction is there in the first place. While conventional medicine takes a “name it, blame it, and tame it” approach to care centered on an appropriate diagnosis, functional medicine aims to identify the root causes of dysfunction and coax back your health naturally. So what does it actually focus on then? 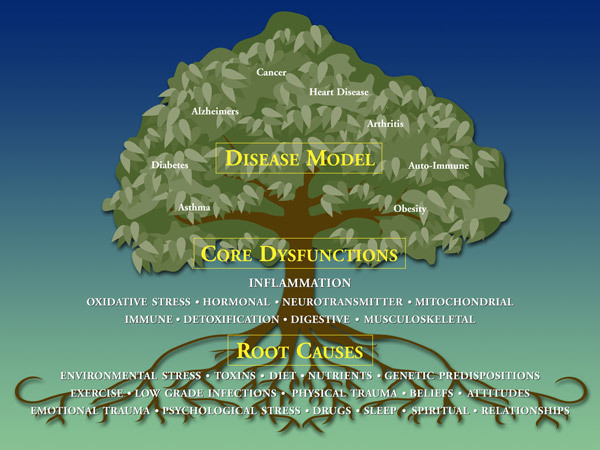 While conventional medicine focuses on the individual branches of the tree, functional medicine focuses on the roots and trunk. You can prune the leaves and branches all that you want, but it is the health of your root system that determines your lifelong health. Functional medicine has narrowed down these factors to seven core clinical imbalances that functional medicine providers look to address. There are limitless ways of becoming healthier on any one of the spectrums discussed below. This is why patients can feel overwhelmed when working with natural providers. They often read multiple sources of information and often find themselves on numerous supplements but without a plan or any benchmarks for success. Which supplements should I take? What dosage? What brands? What should I eat? Why do I read so many different perspectives? The key is finding a practitioner that you like and that you have rapport with. They are your coach just as much as they are your health professional - and they will work with your existing team to match a care plan that is specific to you. Are Free Radicals and Oxidative Stress Aging You? Dr. Scott Mills, DC, shares his experiences trying a new Crossfit gym and gives some important principles for injury prevention and the enjoyment of the experience. 5 Lessons I learned in My First Year of Crossfit. Email Deb at ddc@clinicalnutrition.com with your location and zip code and she can help find a CCN (MD, DO, DC, RPh, etc) near you. There you have it! I hope that you have a firmer grip on what functional medicine is all about and how it might play an important role in your life. If there is an article or resource that you think should be included in this post...feel free to email me at ARinehartDC@gmail.com and I will review it and see if it fits with the message. Please take a moment to share with a few friends or family members that you think would benefit from this information.